The office complex I worked at in Singapore wasn't like any I've seen here in the US. Four towers, each nearly 40 stories tall, set atop a mall that expanded out a number of blocks. There were over 100 restaurants and 400 shops below me. Picking where to lunch was a chore. On days when I was feeling guilty about myself for whatever I'd had for dinner the night before, I'd head to my favorite sushi restaurant in the complex and order their Ichiban Jyu Don—salmon sashimi slices over a thin bed of sushi rice, topped with a drizzle of sesame oil, chiles, and scallions. Of course the Japanese would be able to create a world of flavor in a five ingredient dish. And, equally unsurprising, I wasn't able to find a similar dish in St. Louis. So I had to make it myself. 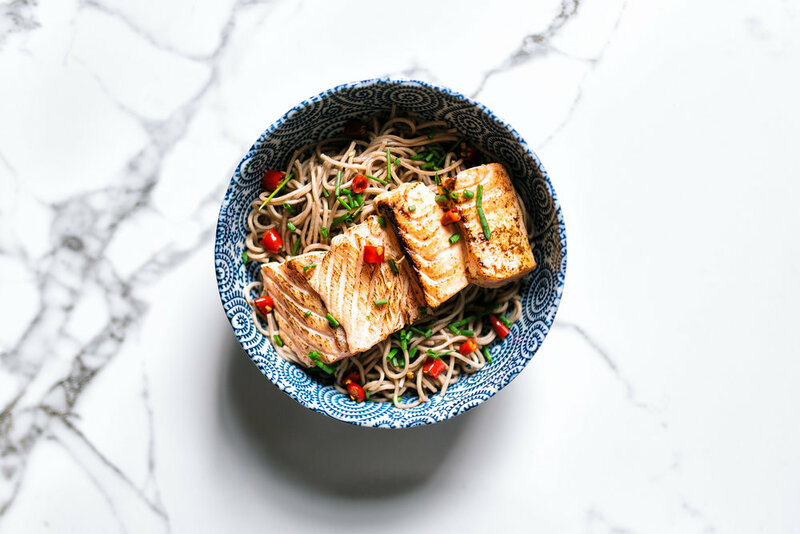 Considering all the fat, cream, and sugar I seem to consume on a daily basis, I opted to make it healthier by using buckwheat soba noodles or quinoa. I'll use sushi-grade salmon or tuna interchangeably, though I prefer salmon. For those of you in St. Louis, you can get sushi-grade tuna at Whole Foods and both sushi-grade salmon and tuna at Bob's Seafood and United Provisions. After some trial and error, I've also started searing the fish, giving it that slightly burned top like a good slice of aburi sushi. I use a blowtorch I got at home depot to do this, but you could sear it in a hot pan with a little oil, or use your broiler. You could also just cook the fish all the way through. You do you. Watch this video or ask your fishmonger how to slice your fish sashimi-style. Set slices aside. Mix mayo with a dash of ponzu or soy sauce and mix well. Set aside. If you don’t have Vietnamese pickled chiles, you can buy any chile you like and use that instead. Jalapeno or serrano would both be good—Thai Bird’s Eye chiles are ideal. Cook soba noodles as instructed. If you’re broiling or blowtorching your fish: spray a baking sheet with cooking spray and lay out the slices. Brush on a thin layer of the mayo mixture. Torch until you reach the char or level of doneness you enjoy.